You do not need to make purchase or payment of any kind to enter or win. PC/Notebook usability rating: 3/5. About 10 minutes to finish, one open question, need receipt. Smartphone usability rating: 2/5. No mobile page for smartphones. No mobile page for smartphones. You are not recommended to finish Famous Footwear Satisfaction Survey via smartphone, it may take more than 15 minutes to finish. 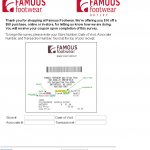 Famous Footwear is part of the Brown Shoe Company, a global footwear company that puts consumers and their needs first by targeting 3 strategic platforms - Healthy Living, Contemporary Fashion and Family. Brown Shoe's more than 130 years of experience has lead to the design, sourcing and marketing of many well-known shoe brands, including Naturalizer, Dr. Scholl's Shoes, LifeStride, Franco Sarto, Etienne Aigner, Avia and Ryka.